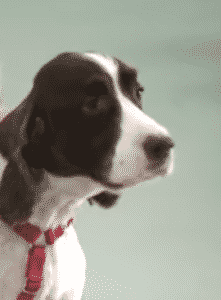 This is the story of Sammi, an 8 year old happy go lucky Springer Spaniel. Like most dogs, Sammi loved to run and play fetch but eventually Sammi was no longer able to do the things that most other dogs could. Sammi’s owner couldn’t figure out why he was slowing down. He was aging but his overall physical health and agility was deteriorating at an alarming rate. Sammi and his owner took a trip to the vet where Sammi would undergo testing and x-rays to determine the issue. The vet determined through the x-rays that additional bone growth along Sammi’s spinal column was the culprit. The bone growth was creating pressure on his spine which in turn caused Sammi’s legs to go limp causing him to fall down. This pressure became so much, that eventually Sammi could not walk at all. He became a quadriplegic. This was absolutely devastating to Sammi’s mom. She would do anything to see him run and play again. It was taking a huge toll on Sammi himself. 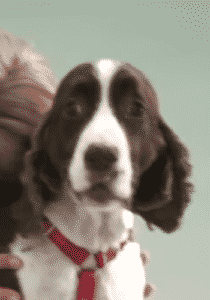 The once happy go lucky spaniel was visibly depressed. He would try and try to lift himself but he just couldn’t understand was was happening to him. 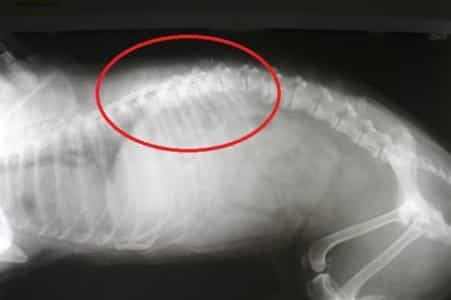 Sammi’s mom was prepared to fork out the money to help her dog, so she decided to have surgery done to remove the excess bone along his spine. Unfortunately, the surgery was unsuccessful. The surgeon attempted to remove as much excess bone as he could, but in the end determined that Sammi would never walk again. But to Sammi’s owner, this was not enough. There had to be something that could be done. 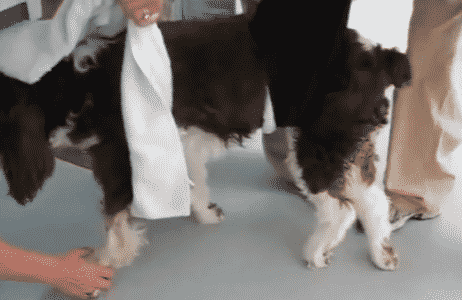 Sammi’s owner was convinced that her dog would walk again and she was not giving up anytime soon. She decided her next step would be to take Sammi to the California Animal Rehab Center. At the rehab center, the vet techs were also fairly certain they could help Sammi. They agreed to work with him and said that it was very possible that he could at least begin to move his head and neck and possibly his upper body. They promised Sammi’s mom that they would try their absolute best to get him walking again, but it would certainly take a great deal of time. “After three months of daily rehabilitation to strengthen his core muscles, including electronic stimulation, electro-acupuncture, assisted standing in the underwater treadmill, and sensory rehabilitation over a therapy ball, Sammi was able to master sitting up from a down position. Treatment was continued to pattern his legs to walk again, while constantly fighting them, as they were stiff and rigid from his neurological condition.” Commented one of the vet techs in an interview with Animal Channel. 8. Running, Playing and Swimming Too! Sammi had finally gained the strength in his legs and muscles to lift himself and stand again. Day by day he was able to do more and more until he was running, playing, swimming and back to his normal happy go lucky self. Everyone was completely shocked and amazed at how far he had come. They think he was even pretty shocked himself! 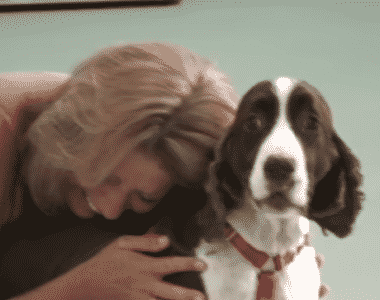 Sammi’s owner was ecstatic when she learned of Sammi’s progress. She visited him frequently at the rehab center and saw day by day the changes. But when she finally witnessed him walking, it was all too overwhelming for her. Sammi literally ran to greet his owner and to get loads and loads of hugs and snuggles! 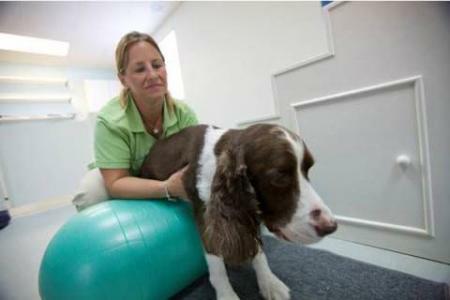 In order to make sure that Sammi’s condition would not worsen over time, his owner was determined to keep him active. She vowed to do everything she could to keep him moving and even entered herself and Sammi into 5K marathons. With the amazing support and care from the California Rehab Center, Sammi is back to the happy go lucky self he was before all of this. It’s as if nothing ever happened. The sad reality is that Sammi’s situation is quite common and unfortunately, most owners simply do not have the time or financial resources to help their dear pets. And often, veterinarians will recommend that owners euthanize them if they are going to live the rest of their lives in pain or paralyzed. Sammi is truly an inspiration to not only his kind, but to humans in similar situations. 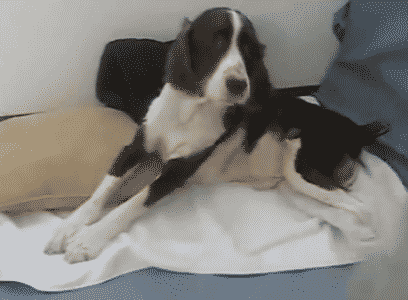 His sheer determination to get back up on his feet is absolutely breathtaking. Sammi’s story preaches how important it is to never give up and to keep pushing through no matter how hard it may seem some days. Set your goals and never stop fighting until you reach them!